There are a lot of people out there that talk about starting storing food but never take action to do it. If you are one of these people who are planning but following through are just wasting your time with your efforts. You need to stop planning and take actions. That’s why backdoorsurvival.com posted this awesome article on food storage mistakes beginning and experienced preppers should avoid and to help prepper start out right with their food storage. Here is what they came up with. Note: These are not in order of importance. Coming to terms with a realistic food storage strategy can be tough. Everyone seems to have an opinion whether it is to focus primarily on store-bought canned goods, commercially packaged freeze-dried products, or food that is preserved at home using a pressure canner. Each has advantages and disadvantage in terms of space, cost, portability, and convenience. Regardless of your stand on food storage, there is a common thread among all preppers. We want our food storage to remain viable and nutritious for the longest period possible. The very last thing we want is to be in a situation where our stored food is no longer palatable or worse, spoiled. By now you most likely know about the six enemies of food storage: temperature, oxygen, moisture, light, pest, and time. Conquering these factors is a constant struggle but over time, each of us learns to cope with them the best we can, and over the years, many books and blog post articles have been written to help you achieve optimal storage conditions. On the other hand, what about some of the other factors that can impede food storage? In our journey to save for the future, and whatever that future holds in store for us, I have made a number of food storage mistakes. I like to call them “goofs” for no other reason than I like to laugh at myself after the fact. I like the word goofs too; it just kind of rolls of my tongue. 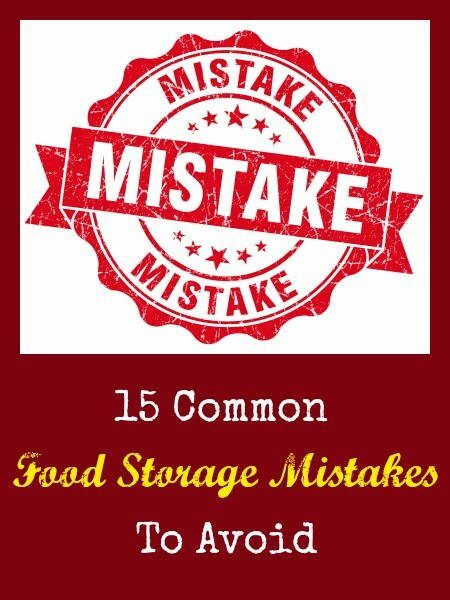 Along those lines, today I list some of my personal food storage goofs as well as some other common mistakes that are typically made in the quest to implement a long term food storage plan. I hope you can learn from them. 1. Storing food you don’t enjoy. Number one on the list is storing food you don’t like or will not eat no matter what. We have all done it: purchased an item when it is on sale because it was a great deal. If you won’t eat it now, what makes you think you will eat it later? Spending money and using your precious storage space on food you will not eat is just silly. All that being said, if desperate, you will likely eat anything. Still, we are talking about preps you are putting in place in advance and not a scrounging effort after the fact when the pantry is bare. 2. Not rotating out of date food items. This has happened to me. A number of years ago I purchased a few dozen boxes of cake mixes because they were really cheap. After a couple of years, the leavening was dead so I wasted good eggs and a half cup of oil on a cake mix that only rose about a 1/2 inch in the oven. My recommendation? Label everything with the date of purchase. Sharpie pens were created for this purpose. Keep a log, or a notebook, or reminders in your Outlook file if you are so inclined. I find it easier simply to clean out my pantry annually. However you keep track, rotate your stored food items the best you can without getting paranoid about it. Many of the “use by” and “best by” dates on canned and packaged goods are put there by the manufacturer but relate more to taste and texture than actual spoilage. Let your eyes and nose be the judge. If the outside of a can is dented, rusted, or shows signs of leakage, toss it. If you open it and it smells off (or even if you THINK is smells off), dump it. Just be mindful that you will want to secure and dump bad food in such a way that children or curious pets can not get to it. 3. Storing everything in the same place. Think about it. If everything is stored in your basement and the basement is flooded, you are going to have a problem. I know, you are thinking that everything is packaged in moisture proof packaging, right? If you have 3 feet of water in your basement, that will not matter since you will not be able to get to it. Canned goods should be on a shelf off the floor, and mason jars filled with home canned items need to be secured to their shelf with a bracket or cordage. The last thing you want is for your precious food jars to fall to the ground and shatter during in an earthquake, hurricane, or other disruptive event. These are just a few of the scenarios that cause your food storage to be inaccessible or unusable. Think about the disaster risks where your live and plan your storage locations accordingly.